Gavin, Baseball, Six Innings, Championship Games, etc. RE-POST: This was originally posted back in August, 2010, and I’m sharing it again because winter is on the wane. My thoughts turn to baseball. Maybe yours do, too. I wanted to tell this little behind-the-scenes story to my baseball book, an ALA Notable, Six Innings. You might even want to buy a copy (who am I kidding?). I don’t like to brag, but. Look at this kid, will ya. That’s Gavin, right around his 11th birthday, back in June/July. We endured a heartbreaking All-Star experience and I had to let time pass before revisiting it. This year, along with my friend Andy, I coached a team of ten-year-olds in the District 13 All-Star Tournament. 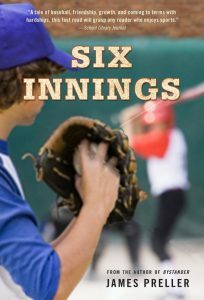 We played five games and found ourselves in the Championship Game — a scenario not much different than what I wrote about in the book, Six Innings (now in paperback). As it turns out, that was the problem. Six innings. Would it were five. 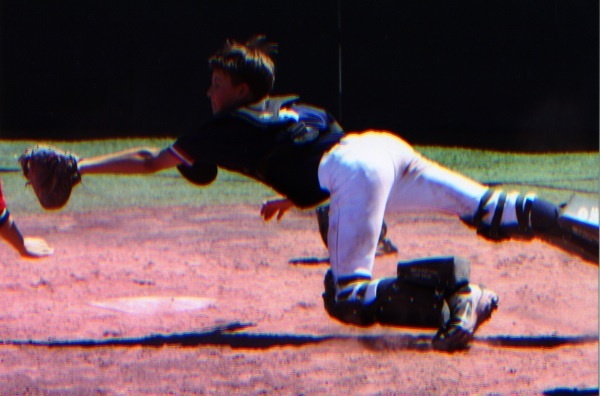 Somewhat unexpectedly, Gavin really shined in this tournament, played the best baseball of his life. Pitched a shutout, fielded great, hit a ton. He was focused and he cared and somehow it all came together for him. 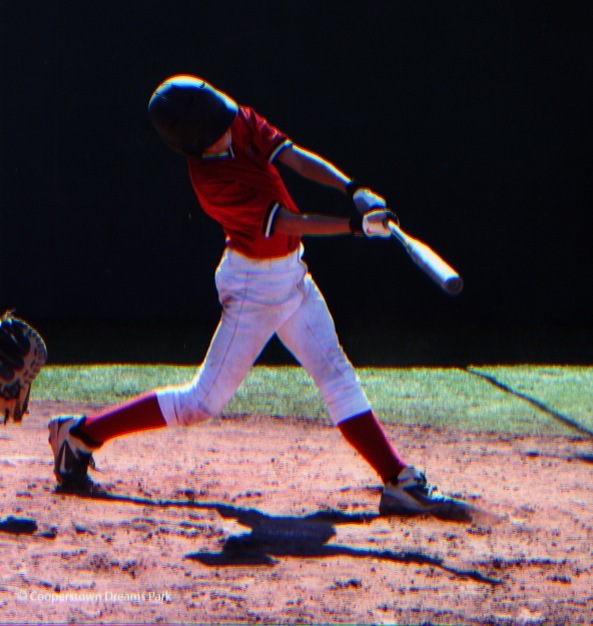 As a parent, you love ’em whether they strike out or hit a double. And let me tell you — it’s easier when they hit the double. So there he was on the mound to start the Championship Game against our talented arch-rivals. It was a tense game, all the boys felt it, and nerves got the best of many of them. Both sides made errors. By the top of the 6th, we were on top, 10-6. Gavin had pitched with poise and determination, but after throwing five full innings and 75 pitches, the Little League maximum for boys his age, it was time to turn the ball over to someone else. We had a four run lead. We needed three more outs. Never happened. Our rivals exploded for 11 runs (!) in the 6th — it was the longest, most brutal inning of my coaching career — and we fell, 17-10, with an ignoble thud. Gavin was seriously bummed. For my part, I slept less than two hours that night. Just tossed and turned and replayed it all in my head, over and over. It was a week before I could walk without a limp. When you write a book, you can get that last out, the boy can kiss the girl, you can pick any ending you want. Real life, that’s a tougher thing. So let’s look at that scene from Six Innings one more time . . .
Max takes the sign, nods, understands. He wants me to climb the ladder. One last time, Max Young is alone in his daydreams, throwing against an imaginary hitter in a game of his own invention. He is the author and the instrument, the pitcher and the ball, the beginning and the end. Max rocks back into his windup, he drives forward, the ball leaves his fingertips, comes in high and hard and true. Angel Tatis hits nothing but air. Swing and a miss. Max drops to his knees, flings his glove high into the sky. All the boys rush the mound, shouting, screaming, piling on . . . .
Quick snap from our recent visit to Mass Moca in North Adams, MA. It’s always good to get to a museum just to let it fill you up. 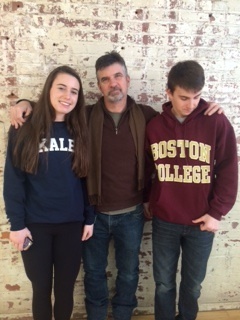 This here is Maggie, 14, proudly wearing her new “Kale” sweatshirt. To the right, that’s Gavin, 15, who basically does not approve of photographs. I’m nearly six feet tall, but Gavin is quickly closing the gap. My oldest son, Nicholas, is not in this photo because he’s a senior in college at Geneseo, NY. 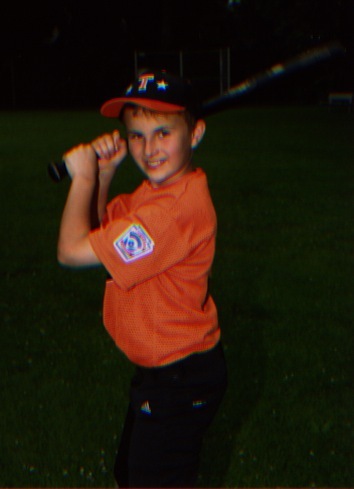 This summer Gavin had the opportunity to play at Cooperstown’s “Field of Dreams” park. His team was one of 104 teams from all over the country to participate in the weekly tournament. The boys stayed in barracks, played hard, and had a great time. Here’s two shots. Amazing to me that he’s in 8th grade already. High school next year. With my oldest already in college, I know where this is headed. Sigh. 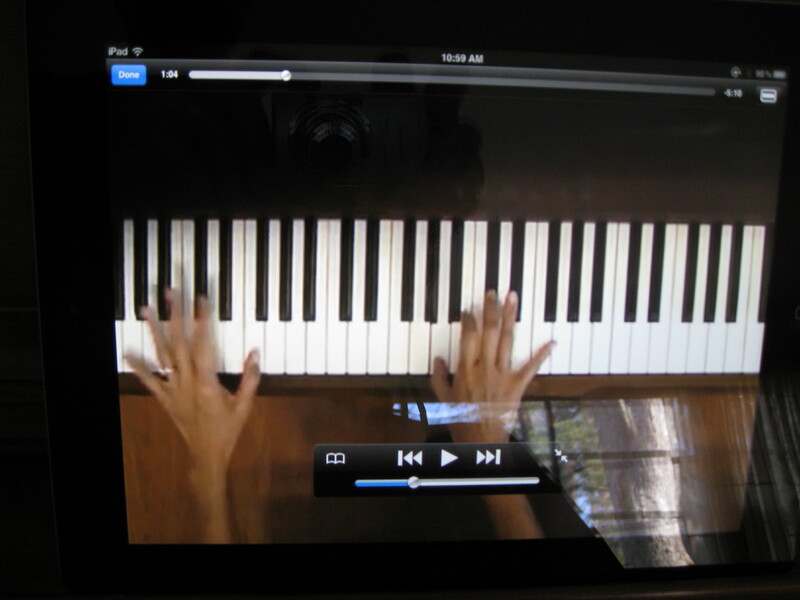 A couple of weeks back I heard Gavin at the piano, teaching himself the main theme to “The Simpsons.” When I saw how he was doing it — through Youtube, and with our iPad propped against the piano — I documented it with a few snaps. Some world we live in, ain’t it? 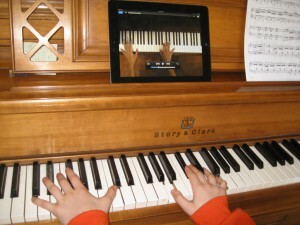 I’ve talked about my son Gavin’s interest in music before. 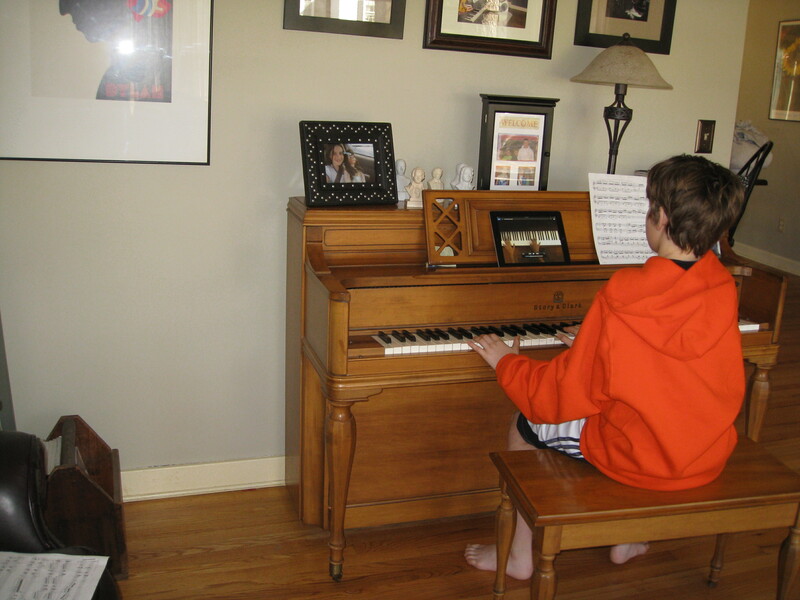 Recently turned eleven, he’s played piano since age four, and then picked up guitar about three years ago. 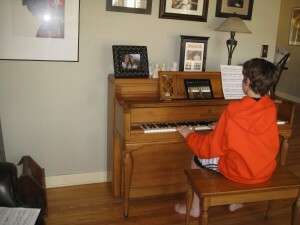 An extremely self-motivated kid, he often goes to Youtube for guitar lessons. He’ll pick out a song, watch the video, then go off and play it. Interestingly — to me, at least — he wants to respond in kind. Obviously, Gavin lives in a different world than I did as a kid. A couple of days ago he announced that he made some videos and put them on Youtube. “You did what?” we asked. I don’t know how to make a video, and I don’t know how to get it on Youtube. But for Gavin, it’s entirely natural for him to figure that out. Anyway, here’s two of his recent efforts. This one he made yesterday, while I was upstairs reading When You Reach Me with Maggie: “The Wind Cries Mary” by Jimi Hendrix . 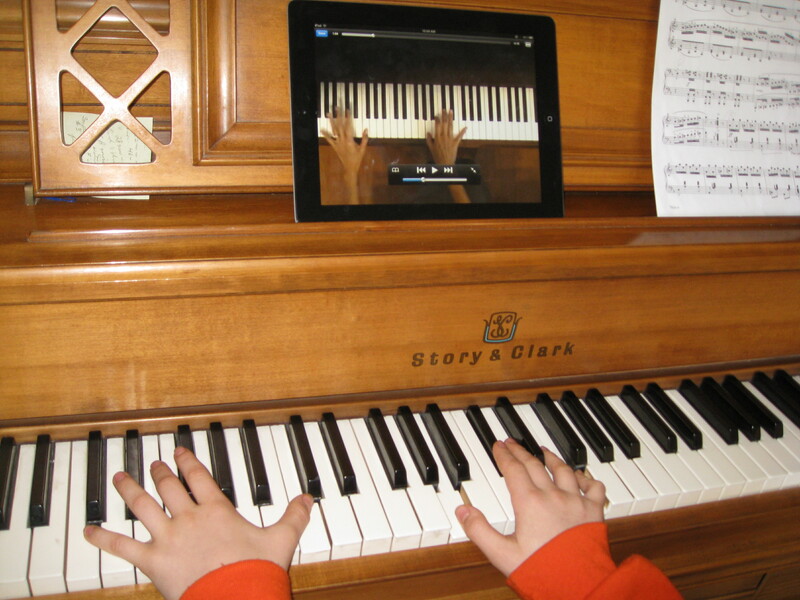 . .
And over the weekend, on piano, he knocked out a crazy tune by Alan Hovhaness, “Macedonian Mountain Dance.” This song he heard another boy play at piano camp over the summer, and returned home determined to learn it. And did, completely on his own . . .
We just sit back in amazement, frankly. Not that he’s perfect, or that these are refined versions, but that he’s out there . . . doing . . . communicating in this modern world.